Includes art book, mouse pad, and papercraft figure. 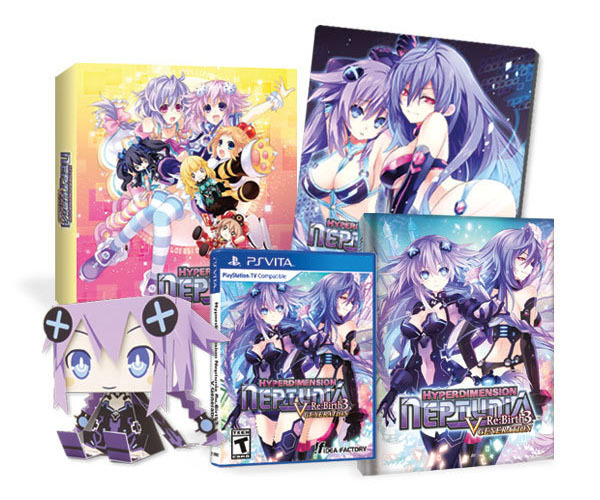 Idea Factory International have announced a limited edition for Hyperdimension Neptunia Re;Birth 3: V Generation. Pre-orders will open on the Idea Factory International Online Store on June 5 at 6 p.m. PDT / 12 p.m. GMT. You can find the U.S. product page here. The product page for the European store will go live on June 5. Hyperdimension Neptunia Re;Birth 3 Artbook – Just looking at the beauty of Re;Birth3 characters on the screen might not be enough to fully satisfy your Neptunia love. But don’t worry – we’ve got just the thing. With 42 pages of character art, illustrations, and more, this hardcover artbook is sure to keep the love going strong! Collector’s Box – Doll up your shelf with this sturdy telescope box! Purple Heart + Iris Heart = Irresistible Hearts Mouse Pad – Capture Purple Heart and Iris Heart in this special artwork printed on a smooth, 1/16″ thick mouse pad. Their irresistible expressions might get in the way of finishing your work…so please mouse with discretion. Purple Heart Graphig Papercraft Figure – As if parallel dimensions weren’t enough, now you can transport Purple Heart into our three-dimensional world with this papercraft doll from COSPA! This has been specially reprinted exclusively for the Iffy’s Online Store Limited Edition. Reversible Case Sleeve – Every gamer needs a snack break, and the CPUs are no different! Flip the case sleeve for some super-cute Tsunako artwork! Hyperdimension Neptunia Re;Birth 3: V Generation will launch for PS Vita via retail and digital in North America on June 30, and in Europe via retail on July 3 and digitally on July 8. A PC release is due out via Steam this fall.